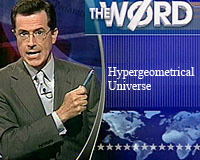 In this Blog, I will present the Theory of Everything which I aptly named The HyperGeometrical Universe. For a deeper analysis, please visit the yahoo group site with the papers and FAQs. Here I will just explore the more interesting aspects of the theory. The origin of the name is not the Hypergeometrical Function, but the fact that all elements of the Universe are described geometrically as solitonic states or deformation waves of a flexible five dimensional spacetime. The added dimension in this space is non-compact and this new simple topology explains everything better than present compact topologies. This is answered by the Hypergeometrical Cosmogenesis Theory. Q2. What lies outside the Universe? Q4. Why can’t one see the absolute past or the future? Q5. Where did the Big Bang occur? Q6. Why is the Universe so isotropic and homogeneous? This is a late line of questioning originated from the measurements of the cosmic microwave background. The cosmic microwave background is considered to be the result of Big Bang and it is puzzling isotropic and uniform. Q7. What is the origin of the Microwave Cosmic Background? Q8. Why isn’t the Universe more like the result of any other three dimensional explosion? Q9. Why is the Cosmological Constant so close to zero? Q10. Can we travel at speeds higher than the speed of light? Are there objects moving at those speeds in the Universe? I will also be happy to tell you What Time is and that Time is both ABSOLUTE AND RELATIVE. Time has always puzzled Mankind. Newton, Einstein and Mach (and others) have their interpretations of time. The nuances will be a little toughter to understand but stick to it and it will be rewarding. b) the attachment to the prior formalism (e.g. Maxwell Equations in Kaluza-Klein Theory,etc. ), that is, one would like to recover asymptotically those equations from whatever Theory of Everything one can concoct. These two forces are really one. The group theoretical considerations are used to keep only topologies that are consistent with prior developments. In summary, we are attached to form as opposed to content. It turned out, that those are unnecessarily restrictive constraints. In my line of thought, I revised the whole formalism by keeping only the reasons behind it. This will become clearer in subsequent blogs. This theory is a simple theory of everything, simple enough to be the framework where one can describe all known (known to me) physical phenomena (nuclear scattering, electromagnetism, radioactivity, gravitation) and it is complete (account properly for all the energy bits that are contained in matter). From Wikipedia - The "Plato's Allegory of the Cave"
Imagine prisoners who have been chained since childhood deep inside a cave. Not only are their limbs immobilized by the chains; their heads are chained as well so that their eyes are fixed on a wall. Behind the prisoners is an enormous fire, and between the fire and the prisoners is a raised walkway, along which shapes of various animals, plants, and other things are carried. The shapes cast shadows on the wall, which occupy the prisoners' attention. When one of the shape-carriers speaks, an echo against the wall causes the prisoners to believe that the words come from the shadows. The prisoners engage in what appears to us to be a game - naming the shapes as they come by. This, however, is the only reality that they know, even though they are seeing merely shadows of images. Suppose a prisoner is released and compelled to stand up and turn around. His eyes will be blinded by the firelight, and the shapes passing will appear less real than their shadows. Similarly, if he is dragged up out of the cave into the sunlight, his eyes will be so blinded that he will not be able to see anything. At first, he will be able to see darker shapes such as shadows and, only later, brighter and brighter objects. The last object he would be able to see is the sun, which, in time, he would learn to see as that object which provides the seasons and the courses of the year, presides over all things in the visible region, and is in some way the cause of all these things that he has seen (The Republic bk. VII, 516b-c; trans. Paul Shorey). This part of the allegory, incidentally, closely matches "Plato's metaphor of the sun" which occurs near the end of The Republic, Book VI.